SET function – How can we help you today? Learn how to use the SET function to create a Klip. The SET function sets the variables specified by the first parameter (must be typed as text) to the values specified by the second parameter and then performs the formula (which uses the first parameter variables) specified by the third parameter. The SET function lets you use a variable in a formula, typically making the formula becomes easier to read and understand. In this example, the SET function assigns the following values. This example uses the following data source. Build a user input control component. For more information, see Creating a filter to display related data. 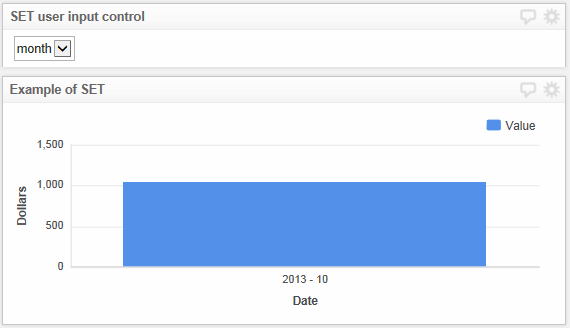 Create a Bar and Line Chart and go to the Klip Editor. Select the X-Axis: Untitled component from the Component Tree. Select data or start formula and click Insert Function. From the Function menu, select Data Manipulation > SET. Select variable names and click Insert Function > ARRAY. Select data, click Insert literal string or number and type "setmonth" (without the quotes) variable and click Apply. Repeat for the setyear variable. Select values and insert the DATE_UNITVALUE function. 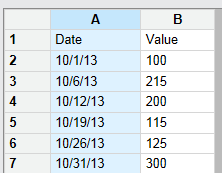 Select values, then select the column that contains the date. If your data source has a row header, wrap the SLICE function around your selection. Wrap the DATE function around your selection. Note the DATE function converts the date to epoch time. Select format, click Insert literal string or number, type the format of the date as it appears in your data source and click Apply . Select unit and select month from the Insert an Option menu. Select DATE_UNITVALUE, wrap the JOIN function around your selection, then wrap the b>ARRAY function around this. Copy the DATE_UNITVALUE part of the formula to data and change month to year. Select the second DATE_UNITVALUE, then wrap the JOIN function around it. With the variables defined, they can be used in a formulas. Select expression, then insert the GROUP function. Select values, then insert the SWITCH function. Select data and insert the variable created in the user input control component, for our example, docset. Select case, then select Insert literal string or number, type the monthly value from the user input control component (for our example, 30) and click Apply. Select value, then select Insert new variable and create and insert a new variable called setmonth. Select setmonth and wrap the ARRAY function around it. Select ARRAY and wrap the CONCAT function around it. Select the second data, then Insert literal string or number and type " - " (without the quotes) and click Apply. Select data and insert the ARRAY function. Select data, then Insert new variable and create and insert a new variable called setyear. Select SWITCH, then case, select Insert literal string or number and type inthe yearly value from the user input control component (for our example, 365) and click Apply. Select value then insert the ARRAY function. Select data, then Insert new variable and insert the variable, setyear. Copy the X-axis formula to the Series:Untitled sub-component. Select GROUP and replace with GROUPBY. Select measure, then the Value column (for example, column B). If the column has a row header, wrap the SLICE function around the selection. From the Properties panel, assign a name to the Series and X-Axis.